I have considered it, and plan to do it when I have a property where I can keep some birds. I was thinking more along the lines of chickens that might produce some quality hackles. I figure I can just pick up feathers they drop (molt) and probably won't need to do any inhumane plucking. Jay, that's a great idea! I have been on the receiving end of some beautiful peafowl feathers obtained this way. If you pick up the feathers soon after they are shed you can normally get some excellent specimens!!! I do that!! My parents have Araucana and ISA Brown chickens-- it always seems like there are feathers lying around! As soon as my new neighbor (lives where the people lived with the Llamas) moved in he brought me 4 bags of duck feathers. Yeh, he's a duck hunter. Only problem I have is I don't know what to do with them. I've yet to find a recipe that calls for duck feathers. Mark, do you have flank feathers or wing feathers or both? If you have the smaller flank feathers, the fibers make great tails as well as wing cases on lots of different nymph patterns. My favorite variation on the Gold-ribbed Hare's Ear nymph is tied with mallard flank feathers for the wing case. It normally out fishes a standard GRHE back in the Smoky Mountains although I haven't tried it here in Colorado yet. Hi, Mark and David, just to jump in here. I have used Mallard Flank feathers for years in tying one of my favorite Streamer patterns. 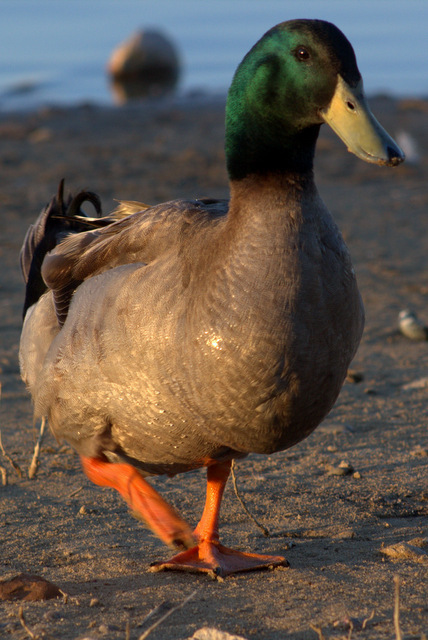 Trouble is I have to buy my Mallard Flank feathers since I don't have any duck hunting buddies. I would look kind of silly chasing them around at the pond in the park where I live just to maybe pick up a flank feather or two. Mel, I'm in the same boat and buy all my feathers. If you ever decide to harvest some duck feathers at the park let me know. I'll be glad to come video the event! Well, I don't have much interest in growing my own so to speak, but I'm always on the lookout for feathers from natural sources or from friends who hunt. I've got some beautiful turkey feathers last year from a friend in Ohio. Best pheasant tail nymphs I've ever tied. Generous friends who hunt are definitely great to have! I have a large collection of pheasant tail feathers from a good friend that come in handy all the time when I'm tying flies! id rather shoot the duck (and pheasants), more time on the water, a great dinner, and feathers to tie flies!